At SkinCare Physicians, our patient-centered approach shows everywhere you look. 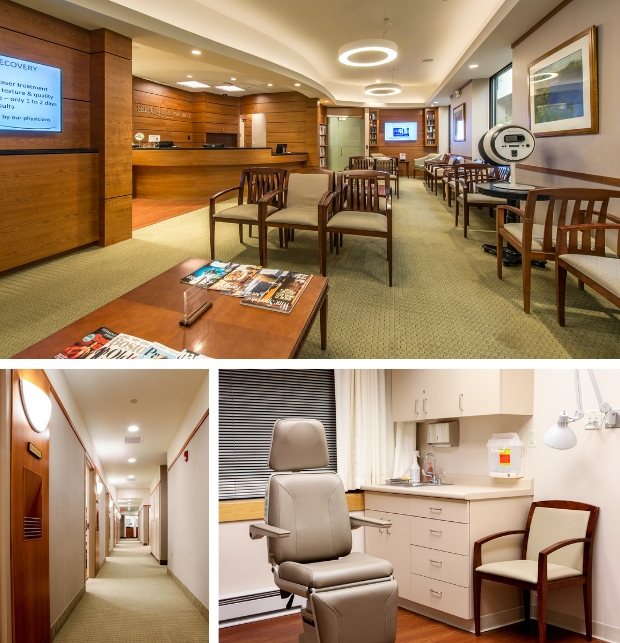 Our expansive, 18,700 square-foot dermatology facility, located just outside of Boston, is a prime example; it is inviting, comfortable, and beautiful, and is equipped with state-of-the-art technology for both medical and cosmetic skin treatments. In greater Boston, our medical and cosmetic dermatology patients receive the latest treatment options and personalized care in a welcoming environment. To experience our facility yourself, request a consultation online or call our office at (617) 731-1600. Our Chestnut Hill location provides easy access, free parking, and is within 7 miles of Boston. Our 25 laser devices enable our dermatologists to custom choose the treatment that best addresses each patient’s needs. With 27 examination rooms, 3 procedure rooms, and 2 aesthetic rooms, wait times are minimal. Waiting room amenities include Wi-Fi, magazines, water, and music. In 2016, we completely renovated our waiting room in Suite 302, adding more open space and light for an enhanced patient experience. We also opened SkinCare Boutique featuring products specially selected by our physicians for our patients’ convenience. In 2017-2018, we expect to complete the expansion of our research department and our administrative area.